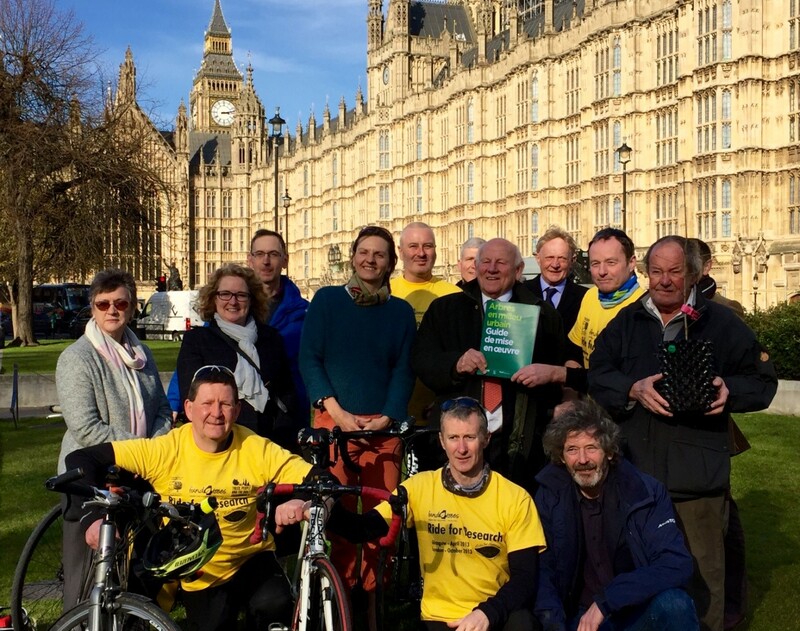 Last month representatives of the key national arboricultural organisations 1 gathered around The Rt Hon Lord Framlingham KT outside the Houses of Parliament to lend their support for the upcoming London to Paris Fund4Trees (F4T) bike ride (read more). The purpose of the gathering was a formal handover from Lord Framlingham to the F4T cyclists of the French translation of Trees in Hard Landscapes: A Guide for Delivery. Outside the Houses of Parliament at Westminster, Lord Framlingham holds the French translation of Trees in Hard Landscapes: A Guide for Delivery surrounded by representatives from the Arboricultural Association, Forestry Commission, London Tree Officers Association, Ancient Tree Forum, Institute of Chartered Foresters, Barcham Trees, the Trees and Design Action Group and Fund4Trees (including the core team of cyclists who will undertake the London to Paris ride, recognisable in their yellow ‘Ride for Research’ T-shirts). Initially published in November 2014 by the Trees and Design Action Group (TDAG)2 , the guide explores the practical challenges and solutions for integrating trees in 21st century streets, civil spaces and car parks. While these are arguably the most challenging environment for growing trees, they are also the areas that can derive most benefits from their inclusion. The publication, which has received endorsement from an unprecedented cross-disciplinary partnership in the U.K. 3 , quickly attracted attention from across the channel – and as a result, VAL’HOR 4 stepped up to sponsor the production of a French translation. At the end of May, the F4T bike ride will be heading to the Porte de Versailles Exhibition Centre in West Paris where the 99th French Mayors Congress is due to be held. The VAL’HOR team will be there to welcome the F4T riders, receive the French translation of the guide and launch it to high profile audience of key French local elected officials. The F4T London to Paris bike ride will also be bringing a sapling from the 1,000 year old ancient Windsor Oak gifted by the Ancient Tree Forum and the Crown Estates to be planted in one of the gardens of the French capital. The 285-mile London to Paris ride will promote Donate1Job and Donate1Hour as sustainable revenue streams for the urban tree research that F4T supports 5 . The ride is being sponsored by Barcham Trees, Urban Forestry (Bury St. Edmunds) and Plantco (France). (1) Ancient Tree Forum, Arboricultural Association, Forestry Commission England, Institute of Chartered Foresters, London Tree Officers Association with Fund4Trees trustees and their Research Advisory Committee Chair. (4) VAL’HOR is the umbrella branch organisation for ornamental horticulture and landscape in France. It brings together 9 professional organisations covering the entire industry: growers, nurseries, florists, garden centres, landscape contractors and landscape architects (more information available at http://www.valhor.fr). (5) Fund4Trees is a registered charity which raises money for urban tree research and particularly engages school children in the value of trees. Donate1Job and Donate1Hour (https://fund4trees.org.uk/donate/) serve to generate a sustainable revenue streams to support the research funded by F4T.